A soapbox is a raised platform on which one stands to make an impromptu speech, often about a political subject. This is one of the angle that the branders were getting at. The other was to pay tribute to Cincinnati's soap making history and the shape of many of the buildings in the W. 4th Street area. I find the angle of public speech and discussion to be most interesting. Fountain Square was seemingly that spot, but that public space has been converted into a hybrid public/private space where I doubt this kind of thing would be tolerated any longer. The branders also mentioned how this could be the spot, in Cincinnati, where young people make their voices heard. Great, many of the new residents in that area are indeed young so this seems to possibly have some traction. The problem is that there seems to be no concerted effort to make this into reality. I look to London's Hyde Park. In the park's NE corner (aka Speaker's Corner) people come to speak publicly about what they wish. They are allowed to continue as long as it is considered lawful. I look at this example and see a huge opportunity at 4th & Plum (GoogleMap) in Cincinnati. That location is right in the heart of the 'Soapbox District' and is currently occupied by a surface parking lot. An ideal scenario would be to acquire this lot and turn it into a park. Create a much needed dog park area within it, sitting places, and lots of trees. In addition to this, make the park the epicenter for public/free speech in the newly dubbed 'Soapbox District.' The idea is great, now let's give it some teeth. 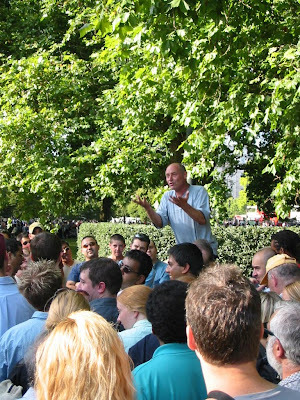 On my only overseas trip, I went to London, and I thought Speaker's Corner was pretty much the greatest idea ever. I was there right before the Iraq war started, and that provided a significant amount of fodder for speakers. I was entertained that although there was a evangelical Christian that we were all going to hell, there were also Muslim and Jewish speakers basically doing the same thing. I had not seen that before. If this happens in Cincinnati, I have my old school wooden Ivory soapbox ready to go. Changing 4th & Plum into a welcoming green space open for public speaking would be genius. I really hope we see this someday soon. I love it. We this really brings the public square back to life. You make some good points. I'd love for that name to be more than just a bit of branding-speak. The area could definitely use a pocket park, and why not allow/encourage vocal dissent and differing opinions to be broadcast there? The issue of Fountain Square as a "hybrid public/private space" troubles me, though, and I don't think it's enough to give up on FS as a public plaza and focus on making the civic soapbox a reality elsewhere. People need to ask and request to use FS as a public plaza and not simply give it up to this shiny new perception of the outdoor mall court. I agree with VisualLingual. I say install a soapbox on Fountain Square. Maybe at the southeast corner or maybe even at the southwest corner by the flower stand. The southeast end down by Graeters could work even when the skating rink is up. I think West Fourth street is too far removed from the center of town to work. Perhaps around the Library? They have lots of underused space. These are good suggestions for Fountain Square. The point I was making is that it seems that FS isn't serving that role as much as it used to, and that Cincinnati is probably in need of some designated location that is always open to this kind of public discourse. London has many locations for this kind of thing. I think it would be great to have multiple locations as well, but this would be a great way to start. You're right that it isn't, but it should. One more thing, which struck me when I originally saw that Soapbix article and was reminded it of it this morning -- how funny that the guy who's spearheading the "Soapbox District" effort is standing next to his soapboxes! i live at 4th and plum - soapbox speakerspace would be a welcome alternative to the parking lot that exists there currently. and (gasp), think of the new development that such a space could bring! A dog park would be awesome downtown, but I'd rather see the void filled with a nice development to fill the gap created by the massive garage to the east...Cooper loves the new dog park in Uptown Charlotte. He goes every day! A touch of nutmeg really bolsters the egg flavours in an otherwise traditional Yorkshire pudding, which can really focus the mind on other issues. Nigel Slater's dumbing-down of cookery means he rarely uses any of the interesting ingredients in my local deli. The problem is that we're always competing instead of working together.